At the end of April 2010 Desertmartin Parish hosted a Parish Mission to celebrate the 150th anniversary of the opening of our parish church St. Mary’s Coolcalm. The Mission was conducted by the Redemptorist Fathers Brendan Keane and Kevin Browne. 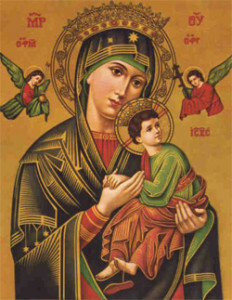 In the months following the Mission, it was decided that Desertmartin Parish should build on its success and invite parishioners to develop a personal devotion to Our Lady of Perpetual Help. Fr. Brendan Keane returned to inaugurate the First Friday Monthly Novena, which continues to be held at every First Friday Mass in St. Patrick’s Church Keenaught. On occasions for pastoral reasons the Novena may be held on the second Friday and the Parish Newsletter will note the change. Everyone is welcome to attend. In the weeks and days leading up to the Novena parishioners are asked to write their petitions on the paper provided at the back of Keenaught Chapel and place them in the Novena Box provided. Please do not put money in this box. Lord Jesus, open all hearts to the experience of God’s love. Come and save us from our sins. Free us from our selfishness. Open our ears to listen to your word. Move our hearts so that we may be reconciled with our neighbours and with God. Pour your spirit into our lives so that we may come closer to you and to one another. Jesus, son of God, have mercy on us. Dear Mother of Jesus, pray for this parish and for every home. Bring peace to every one. O Mary conceived without sin pray for us who have recourse to you.